Author James D. La Rue, Jr.
Mary Brooks: Portrait of a Kentucky Pioneer, Granny Woman, Family Matriarch tells the fascinating story of one of Kentucky’s earliest settlers who became the Matriarch of the La Rue and Enlow families. Her descendants include a Governor, a United States Congressman, a Master Distiller, and numerous Baptist Preachers, among many others. Family lore notes Mary Brooks as being the Granny Woman present at the birth of Abraham Lincoln who was born on the Sinking Spring Farm just south of Hodgenville, however, History has given that honor to her daughter, Margaret “Peggy” Walters. Mary Brooks begins with her harrowing journey by flatboat (at age 18) down the Ohio River to one of the first pioneer settlements of Central Kentucky in the late 1700s and chronicles her new life at Philips Fort with trailblazer John La Rue. Mary Brooks’ (1766 – 1843) remarkable life story includes outliving three husbands, giving birth to 13 children, and becoming the primary female ancestor for hundreds and hundreds of families from Kentucky to the Far West and in between. The book is 173 pages, full-color, and bound in soft paperback. 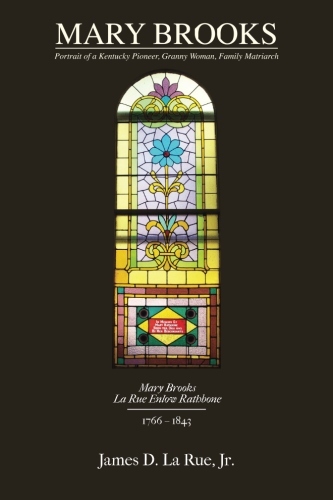 Mary Brooks is truly a labor of Love by author James D. La Rue, Jr., Mary Brooks’ great-great-great grandson, who is the official historian of La Rue County, Kentucky. This book sounds very interesting and I do want to read it! !